csGrain using the CSOUND software synthesizer and signal processor gives us a great set of tools to record and process audio in real-time. Take a live or imported recording and dramatically morph them into whatever your imagination inspires. So much can be done using the powerful stereo granular sound processor and 10 professional audio FX simultaneously. Its cool! A clean interface lets you get things done without any hassle or confusion. Everything is laid out nice and tidy right in front of you. Maybe a bit drab in appearance, but pretty slick nonetheless. No worries about trying to find anything here. I’ve spent many hours enjoying the range of options tweaking various recordings I made resulting in some rather wild samples. I love that you can set each of the parameters to move within a predetermined minimum to maximum range or totally at random. A long touch on any of the knobs leads to the Random Settings where you can choose to have that particular function move within the selected range. If you can’t decide on what to set things at, just hit “randomize”. The knob will darken so you don’t lose track of it. Overall the audio quality is really very good. I didn’t experience any unwanted noises. It all came out sounding clean, and just as intended. The 10 FX are well made. The Reverb is pretty thin, and leaves much to be desired though. Applying all 10 FX at once didn’t even cause me any grief, and csGrain just kept working away twisting up the samples for as long as I recorded them. The included preset samples are nice, but of course its more about playing with your own. Managing your audio files and recording is easy within the app. You can save your things in the “My Audio Files” section found at the bottom of the screen. From there you can also select and do a simple edit of the file. csGrain also is great for field recordings using (careful of feedback) the device mic, or better an iRig Mic. 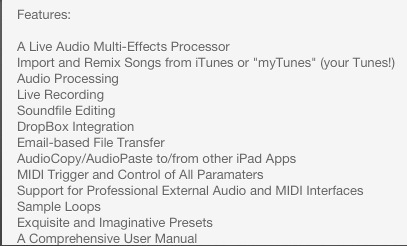 Import supports AudioPaste, Dropbox, and iTunes. Export via Email, Dropbox, AudioCopy, and “Open In…” Sharing made easy, just how we like it. Also included is a handy, detailed user manual complete with well written instructions, and sample photos. If that still doesn’t answer your question, you can Email Customer Support from the manual. 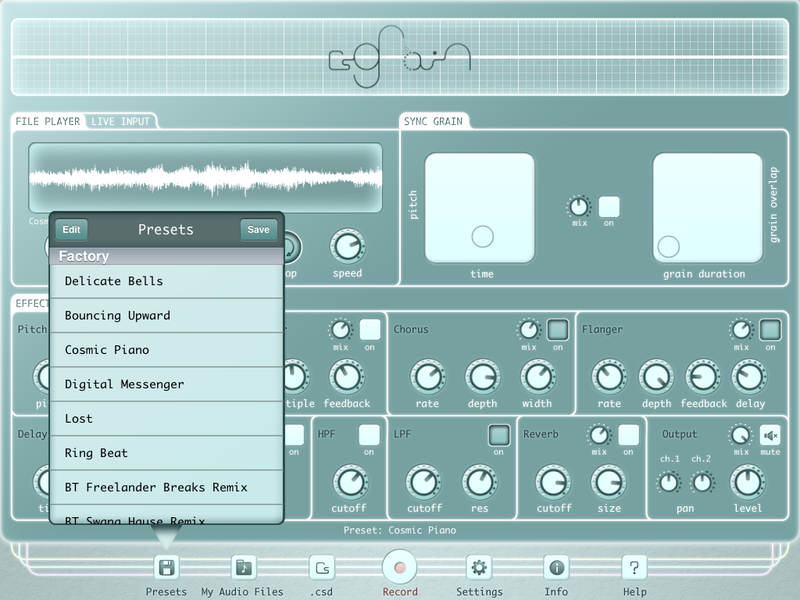 If you want something for manipulating recordings in subtle to crazy ways that sounds great, csGrain will do the job. This is a wonderful app loaded with tools, features, and functionality. This is where you go for special audio effects for your music or audio projects. If you want to have some fun, you can also mess up tunes from your iPod library. Why not? Pitch Shift, & speed up the latest viral hit from that obscure hippity hop artist that just wont go away. 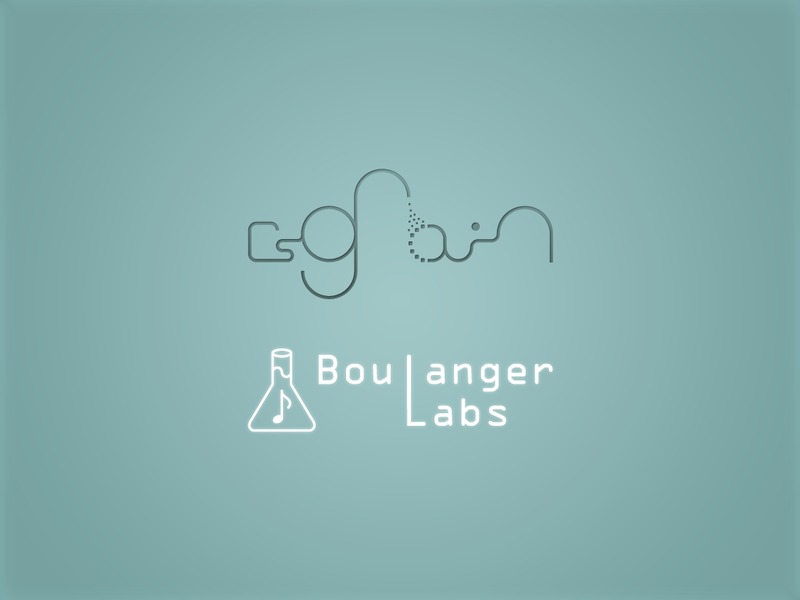 Whatever you want to do, in this app you can certainly do it with Grain Style! Available now! Click HERE for details and to purchase this huge compilation of over 14 hours electronic music. 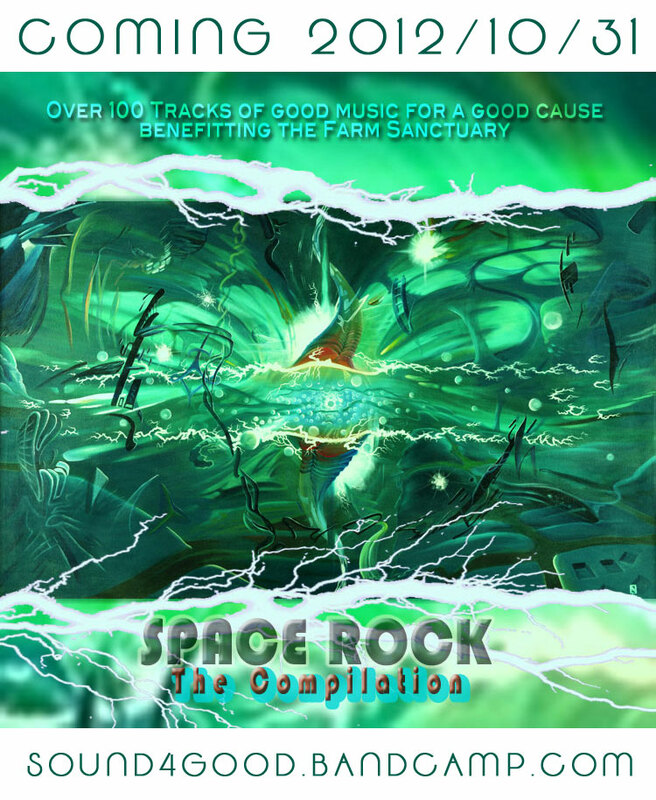 Good music, and a good cause for Farm Sanctuary. 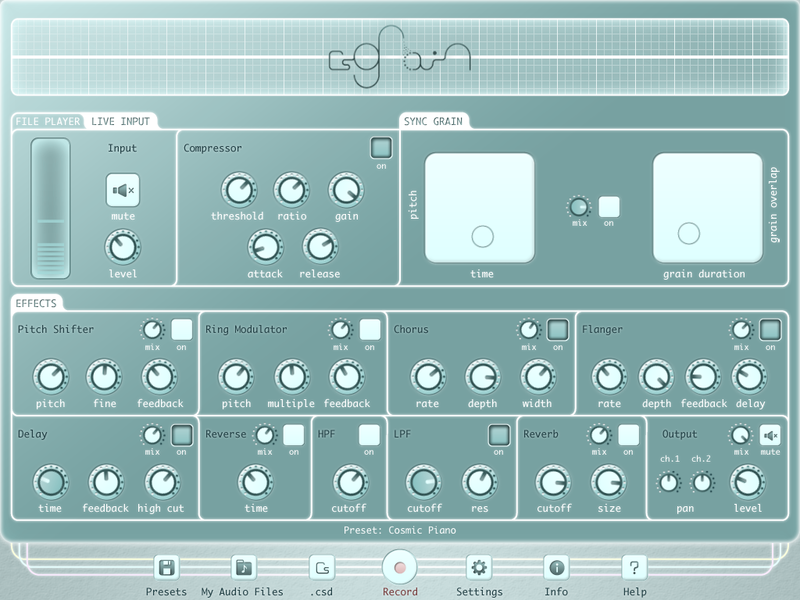 NoisePAD is straight forward “drum computer”, sequencer and beat maker designed for live performance. NoisePAD has a very nice look. It’s elegant in appearance and quick to navigate. The design is streamlined, making it very easy to use and understand fast. A quick, to the point INFO page will easily answer any “how to” questions within the app. 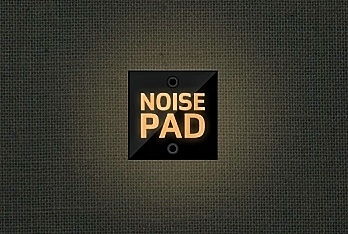 Delivered with 5 preloaded sound-banks, each containing 12 samples, NoisePAD comes ready to get started. 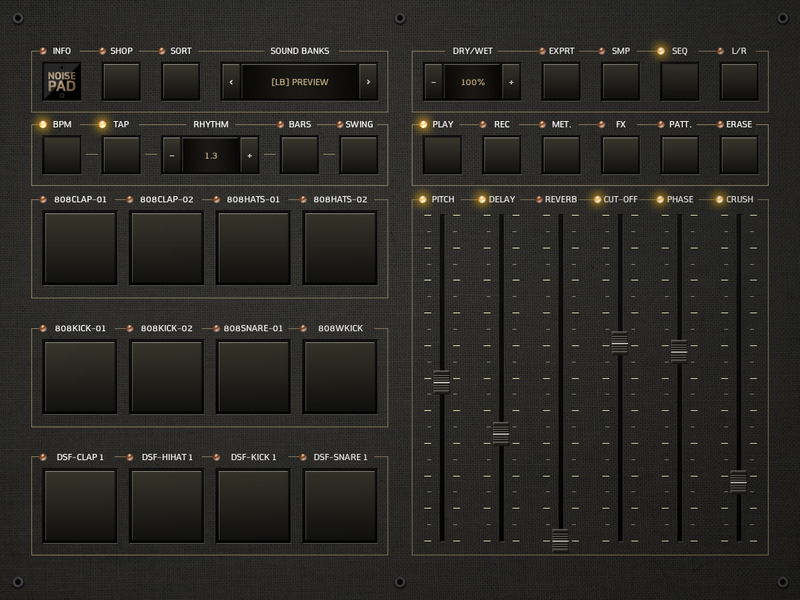 The built-in sequencer is programmable up to 12 patterns each with its own length of bars from 1 to 99. Patterns flow seamlessly; one right into the next. 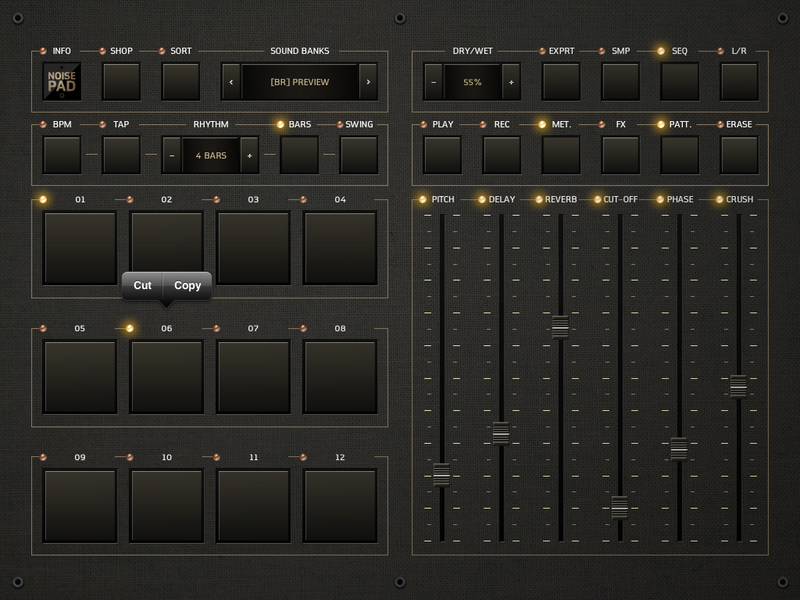 With some nice effects controlled via sliders, there’s some great sample tweakability at your finger tips. The included effects are: Pitch, Delay, Cut-off, Phase, Reverb, and Bit-Crush. They sound alright, and suit a party atmosphere very well, but have no real controllable parameters to fine tune the FX. Recording and performing on the fly are just a tap away. Mute, Solo, adjust BPM, and Swing without interrupting the flow. Same goes for selecting samples, loading new ones won’t disrupt the performance. Paste in your samples from the paste board and custom organize sample banks however you like. If you want more samples there is an option to purchase them via IAP additional sample banks. I have noticed some slight latency from the pads here and there, but really not very much or often. The preloaded samples in NoisePAD range from good to outright absurd. I honestly cannot imagine anyone buying another sample bank that really anyone could make. I mean, some of the samples are just terrible vocals of some kid swearing, dropping F bombs, or no brainer one liners we have all heard a bazillion times, and whatnot. “Damn Girl” “Drop It” “Hands up,” “Party people” are some of the overdone hype samples you’ll hear. I get that it’s intended to be for fun, but they just aren’t inspiring to me at all. The drum samples are pretty good; but with only 12-36 samples per IAP they leave a lot to be desired with some wasted on vapid vocals. Seriously, these are popular “artists”? Can’t you just sample yourself shouting “Put your hands up”? There, you’re a popular artist. Most of the drum or instrument samples are not really worth the expense as they are all easy to make yourself with the right apps. To be fair I supposed plenty of people think these kinds of tired samples are great fun. I get that, and NoisePAD is fun, especially after you load it up with your own creative samples. It does make things convenient. That said, it falls a little short of professional. It’s not something I would suggest using for a pro live set if you want to impress anyone. It seems to me that NoisePAD is really a party DJ performance app intended to make adding samples to live sets fun and easy. It does that very well. If the FX, sample packs, and general quality matures and improves, NoisePAD could contend for the attention of a more serious, artistic crowd. The future of NoisePAD could develop into something very special. Keep an eye on it.